This is a continuation of my DIY Bangkok itinerary posts. The first post, Bangkok DIY: The Search for the best Phad Thai included our prepared itineray for 3 days. The second one, Behind the scenes of the DIY Bangkok Trip, discussed useful sites you can use in preparing your DIY trip to Bangkok. For this post, I will discuss, in detail (as much as I can remember), our second day in Bangkok where we toured the Wat Pho, Grand Palace and Wat Arun. We capped the day with mall hopping at Siam Center and MBK. Boat ride from Central pier to Tha Tien pier aboard the orange flag (express) boat. (20 minutes) *If you took the non-express boat, expect a longer boat ride. For the temple tours, we concentrated only on 3 temples/attractions: the Wat Pho, Grand Palace and Wat Arun. 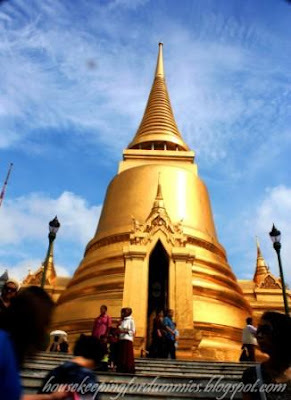 These three are relatively near to each other and they are among the most famous tourist spots in Bangkok. Those who are staying for more than 3 days may add other attractions like the Vimanmek mansion, Chinatown, etc. Looking back to our itinerary, I wished we got off at Tha Chang pier instead and went on the temple tour in this order: Grand Palace-Wat Pho-Wat Arun. Why? I find it more strategic to do so, even if the Wat Pho opens earlier at 8AM. People tend to flock the Grand Palace even before it opens at 8:30 AM so expect a thick crowd it you come much later. I just decided to put the Grand Palace first because I thought we can catch the 10AM free English guided tour—we didn’t. Ergo, we had a hard time taking pictures without other tourists ruining our view. Since you’d be spending more time outdoors while touring the Grand Palace complex, it is but logical to start there early, unless you want an instant tan as bonus from your tour. Start at 8:30AM when the sun isn’t that hot yet and when you finish around 10 to 11AM and go to Wat Pho, you won’t mind the noontime sun since you’d spend most of the time indoors in the wat. Since we made a mistake of going to Wat Pho first, we had to endure that looong walk along the side of the Grand Palace again to go to Tha Tien pier. I was deceived by the googlemaps view of the area, thinking that it’s just a short walk from the Wat Pho exit to the Grand Palace entrance. Then we had to go back to that route again to go to Tha Tien pier. Great exercise but bad for aching feet. The Grand Palace public entrance is along Na Phra Lan Road, almost across Silpakorn University. It’s just a short walk past the market if you're coming from Tha Chang pier. The entrance fee of 350 baht each may seem steep but it's worth it because of the many attractions inside plus the entrance ticket already includes entrance to the Vimanmek mansion. The mansion is not within the area of the 3 temples but it’s a short cab ride from the Grand Palace (less than 10 minutes). We opted to skip the mansion since we have other plans after touring the temples. Make sure you have proper attire when touring the Grand Palace: no shorty shorts, etc. I was wearing long pants then but there were areas withing the palace grounds (i.e. Royal Pantheon) where a strict dress code is implemented: only men in pants and women in long skirts were allowed inside. I was surprised to see tourists wearing flip-flops while inside the palace grounds as I was previously informed that they’re not allowed. I wouldn’t take risk wearing flip flops just in case they suddenly become strict with the footwear. What I did is to wear my crocs prima then I have a small bag containing my flip flops in case my feet needs a break. In case you are already famished after the Grand Palace tour, there's a market at the left side outside the palace (walk towards Tha Chang pier) or you can cross the road from the palace entrance to Au Bon Pain cafe. Entrance to the Wat Pho is along Thai Wang road, just at the back of the palace. For non-Thais,you need to pay 50 baht each. The Wat Pho houses the grand reclining buddha. Don't be too mesmerized with the buddha to miss its feet made with mother of pearl inlay. From the Wat Pho, you walk straight past the market to Tha Tien pier to take the Wat Arun cross river ferry (fare: 8 baht). Once you get across, you'd see the Wat Arun grounds enclosed in a gate, just walk around it towards the back to get to the entrance (fee: 50 baht each). The highlight of the Wat Arun is the main prang (Khmer-style tower) which can be seen from across the river. You can go up the main prang (up the the 2nd level only) but you have to be very careful since the steps are quite steep. While the main prang looks magnificent during the day, it looks way better at night. For those who want to take pictures of the Wat Arun at night, The Deck at Arun Residences provides the best vantage point. Snag a seat along the balcony overlooking the river and enjoy the view while sipping Beer Chang or Singha beer. Ang ganda, lalo na yung lalaki sa stairs ang pogi kahit nakatalikod! hi! I just want to ask if there is an exit at the back of Grand Palace near the Wat Pho entrance, or do we really have to go back from where we entered then take that long walk to Wat Pho? thanks! Unfortunately, you have to go all the way to the Grand Palace public entrance from Wat Pho. The other entrance to the palace (I saw several along Mahachai Rd.) are not for public use. I didn't see a back gate (at Thanon Thai Wang) either. That's why if you are to go to Grand Palace, Wat Pho & Wat Arun, it would be much better to go down to Tha Chang pier and tour the 3 sites in this order. This way, you only get to walk along Mahachai Rd. once. Oh I see! Guess I have to endure that long walk too..Thanks for the info Tin. Your site is really helpful. You can ride the tuktuk if you don't want that looong walk or if you have kids or elders with you. We just opted to walk since I've read that tourist are charged with a much higher fare than the locals. Very helpful article indeed, planning a trip to go there next year, I researching as early as now so I will have an idea as to how much should I save for everything. What's up to all, the contents present at this website are genuinely amazing for people experience, well, keep up the nice work fellows. If you want to increase your familiarity only keep visiting this web page and be updated with the newest news posted here. Great information, For everyone who need to know about things to do in Bangkok, please contact with GoAsiaDayTrip.com. They are most trusted tour company in Southeast Asia. Hi! I'm Thien from Vietnam. Thanks greatly for your sharing! Your article is really detailed and interesting. If you wish to experience other neighboring countries of Thailand like Vietnam, you can refer to this Vietnam Free Tour from GoAsiaDayTrip to have some local friends who can help you during your trip in Vietnam. This is a free-of-charge program so you don't need to pay for that.